The educational equity theme ran throughout the conference presentations and breakout sessions. Advising Conference (UCDAAC). This year, the event received one-time funding to focus special attention on programs related to students coming from Local Control Funding Formula Plus (LCFF+) financed high schools. California’s LCFF+ legislation designates specific increased allocation of resources to the state’s most needy schools. 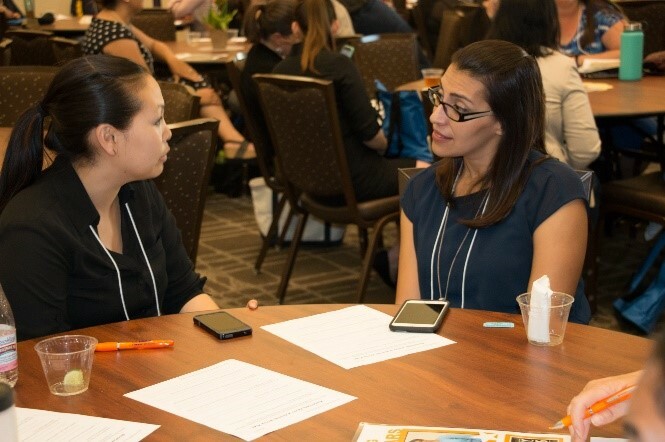 As such, conference co-chairs Emma Martinez, Caitlyn McCarthy, Kathy O’Neill, and Elia Salgado conceived the theme, “Promoting Educational Equity through Advising,” around strategies to best serve LCFF+ origin students. Conference attendees heard from Ruben Canedo of UC Berkeley and Suzanna Martinez of UC Office of the President during the morning opening session. As respective leaders from the UC Global Food Initiative: Food Access & Security Committee and the Nutrition Policy Institute, Canedo and Martinez presented data on college student hunger and homelessness. They shared the knowledge that students with uncertain or limited ability to cover basic needs suffer holistically, potentially impacting mental health, physical health, emotional health, academic performance, general wellness, and student success. Notably, food/housing insecure students are not always from the lowest income population. Through their work, Canedo and Martinez aim to propel UC into a basic needs secure system for all students. Seven of the conference’s fifteen breakout sessions, that took place during three 75-minute timeslots, directly addressed the LCFF+ theme. These sessions focused on foster youth, innovative initiatives, expanded interventions, students with dependents, navigating the university, and success coaching. In addition to the LCFF+ session emphasis, many of the remaining breakouts incorporated distinctly interactive elements. Finally, a new feature for 2017, participants had an opportunity to actively practice self-care via breakouts dedicated to this purpose with an informal arboretum tour and a more formal Jan Shrem and Maria Manetti Shrem Museum of Art tour. The UC Davis advising community faced new challenges with incredible energy during the 2016-17 academic year. Executive Director of Academic Advising, Brett McFarlane used his lunch hour presentation to acknowledge community engagement and highlight advisor successes. He recognized the 2016 UC Davis Academic Advising Award recipients, the Harry and Eleanor Walker Award recipients, the 2017 NACADA Region 9 Award recipients, and the 2017 Global NACADA Award recipients. Additionally, McFarlane identified upcoming opportunities for professional development in California and beyond, including the next NACADA Regional Conference. The 2018 Region 9 Conference Planning Co-Chairs, Kate Creveling and Melissa Whaley, announced plans for the event; the UC Davis hosted conference will take place in Sonoma March 21-23, 2018. Co-Chairs intend to recruit planning committee volunteers during summer 2017. The UC Davis Academic Advising Conference provides an opportunity to engage with colleagues across campus. As a result of feedback from previous years, conference-goers had more opportunities for networking with colleagues. Along with a written reflection activity, a significant amount of time during lunch was dedicated to making purposeful professional connections. Additionally, Fenton’s Creamery served late afternoon ice cream sundaes during an extended break while attendees had the opportunity to interact with colleagues. Prior to an event-concluding raffle, a panel of representatives from student serving centers considered questions about equity, culture, and identity from moderator, Leanna Friedrich, as well as the general audience. Panelists included Eric Sanchez from the Center for Chicanx and Latinx Academic Success Center, Kayton Carter from the Center for African Diaspora Student Success, Michelle Villegas-Frazier from the Native American Academic Success Center, Arnette Bates from Advising and Retention Services & EOP, and Jinni Pradhan from Middle Eastern and South Asian Student Life. Panelists emphasized the importance of recognizing the complexity behind students’ identities and the need for students to feel connected. 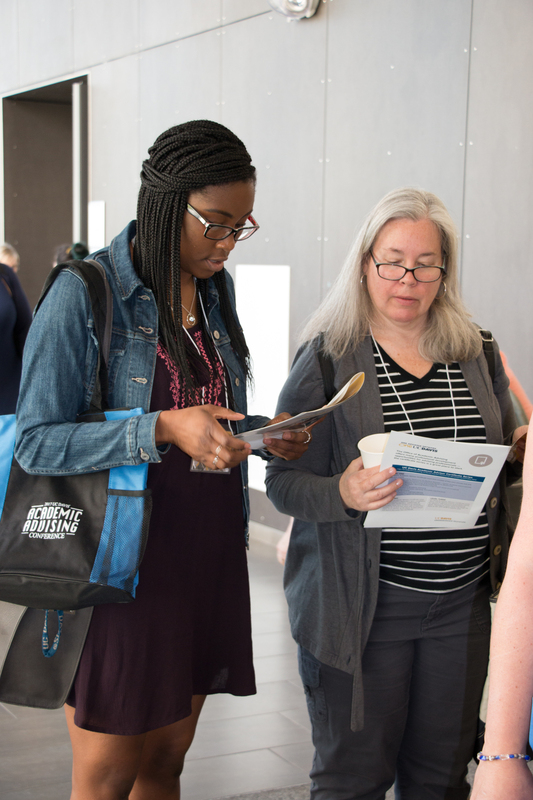 The LCFF+ funding that supported the 2017 UC Davis Academic Advising Conference guided the discerning content that coalesced to produce a dynamic experience for attendees. The Office of Academic Advising thanks everyone who worked hard to make this event a success.